Human nervous system. 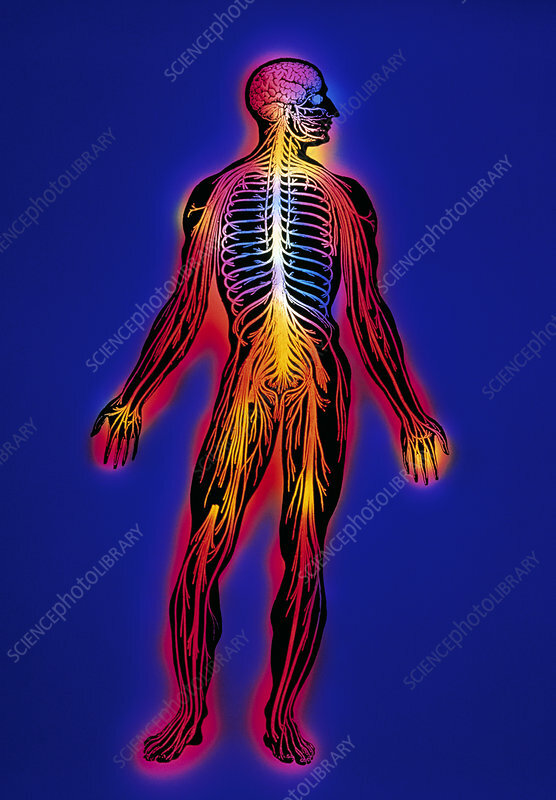 Coloured historical illustration of the nervous system within a human male figure. The brain (at top) and spinal cord constitute the central nervous system (CNS). The CNS integrates all nervous activities. There are 31 pairs of nerves that branch off the spinal cord into a network; they carry nerve impulses from the CNS to various structures of the body (skin, skeletal muscle, internal organs, glands) and back from these structures to the CNS. Nerves outside of the CNS are part of the peripheral nervous system. This nerve anatomy allows the human body to respond to outside stimuli, to move, feel, and to make intelligent choices.